An internationally known Family Entertainment studies and design firm, Entertainment Concepts, Inc., is uniquely qualified to provide you with continuous services from your preliminary concept development and initial planning stages through to final design and beyond. Founded more than 34 years ago by its President Peter F. Olesen, P.E., the firm has continually sought to improve the safety, entertainment value and excitement to all the attraction plans it has created. Entertainment Concepts, Inc., provides engineers, designers with many years of experience in the developent of outstanding attractions for our clients. Over the years, we have become an industry leader in the development of new and exciting concepts for go-kart tracks, minature golf courses, bumper boat ponds and other attractions. All concepts are developed with safety and accessibility being of prime concern. Staff expertise and experience extends to traffic studies, municipal and private industry projects highway design, stormwater management and relatedcivil engineering work. Pinballz - Austin Texas (Scheduled Opening Late 2018) Development of floorplan concepts for expansion of existing indoor FEC into adjacent 55,000 s.f. space. Attractions include 6,000 s.f. Laser tag arena, escape rooms, birthday party rooms, meeting rooms, bar area and point of sales. Developed concept through final design of 470-foot electric (battery powered) go-kart track. Victory Fun Park - Lewisburg, Tennessee (Open Summer 2013) The initial project, scheduled for opening in August consists of a nine-hole miniature golf course and parking lot plus a small clubhouse & game room. A second nine - holes will be constructed in the spring of 2014 along with a dual WaterWars and a children's play area. 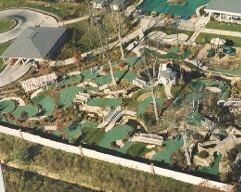 Complete FECs such as America's Action Territory in Bristol WI, Shakers Family Entertainment Center in Calgary Alberta, Sugar Grove in Sugar Grove, Illinois, The Park at Middletown KY, Caddie Shak in Donegal PA. Family First Sports Park in Erie PA, and Qwivals Family Entertainment Center in Victor MT. Representative Go-Kart Track Clients include, Hollywood Park in Crestwood IL, CJ Barrymores in Clinton Twp MI, Haunted Trails in Joliet IL, Crystal Lake in Rock Falls IL, Malibu SpeedZones in Dallas TX, Los Angeles CA and Kenesaw GA, Green Acres in San Antonio TX, The Fun Factory in Yuma AZ, The Park at Middletown KY, White Mountain Speeway in Tamworth NH, Frankies Fun Parks in Greenville, Columbia and Raleigh SC, Qwivals Family Entertainment Center in Victor MT, Putt- Putt Golf and Games in Mandeville LA, Caddie Shak in Donegal PA, Shakers in Calgary Alberta, Springz in Ocala FL, Sugar Grove Fun Park in Sugar Grove IL, Family First Sports Park in Erie PA, Amazon Station in Janesville WI, America's Action Territory in Bristol WI, Stratford Speedway in Stratford CN, Skateland in Queensbury NY and Overlook Speedway in Poughkeepsie NY. Representative miniature golf course clients include, Sugar Grove Fun Park in Sugar Grove IL, Qwivals Family Entertainment Center in Victor MT, Shakers Family Entertainment Center in Calgary Alberta, The Park at Middletown KY, Fun Zone in Geneva-on-the-Lake OH, Fast Lane Fun Park in Cookeville TN and Fort Frenzy in Fort Dodge IA. Representative bumper boat pond clients include, Sugar Grove Fun Park in Sugar Grove IL, The Park at Middletown KY, Amazon Station in Janesville WI, Caddy Shak in Donegal PA, Family First Sports Park in Erie PA,, Adventure Zone in Deep Creek Lake MD, America's Action Territory in Bristol WI and Fort Frenzy in Fort Dodge IA. FEC Feasibility Studies for clients in AL, AZ, CA, FL, IA, IL, GA, KS, MN, MT, OH, OR, PA, TN, TX, WA, WI.